Description: Running wild and free into the sunset, this Running Horse, adorned with windswept mane and flowing tail, is graced with muscle that is so powerful yet so gentle. 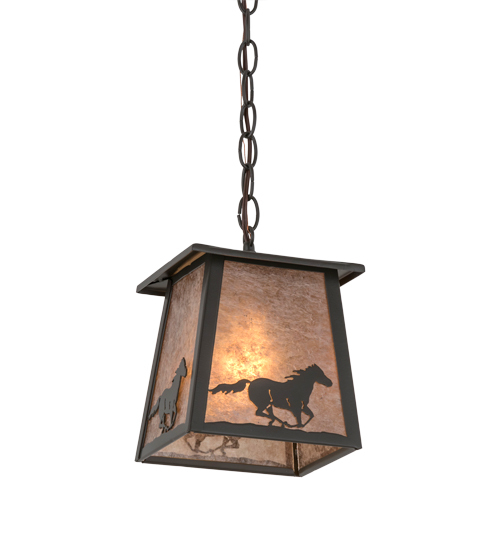 This exquisite pendant captures horse silhouettes with matching frame and hardware in a Timeless Bronze finish, against a stunning Silver Mica diffuser. Handcrafted at the foothills of the magnificent Adirondack Mountains, this pendant is available in custom sizes, finishes and colors, as well as dimmable energy efficient lamping options such as LED. UL and cUL listed for damp and dry locations.